This article is about the level in Super Mario World. For the course in Super Mario Kart, see Donut Plains 3 (SNES). Donut Plains 3 is a level in the game Super Mario World and is the third level of the second world, Donut Plains. This level, taking place above a mushroom forest, is filled with several kinds of platforms and it is also the first level to feature ON/OFF Switches. It is occasionally difficult to land on the right platform, because in many spots, there is only open air. Jumping and missing the platforms would make Mario or Luigi lose a life. The player starts out next to many platforms. After getting through, the player comes to an area with Koopa Troopas and Winged Koopa Troopas. There are also some Rotating Blocks under the player. 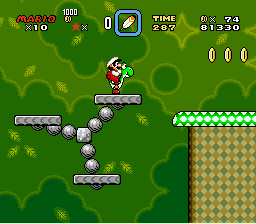 If the player is not Small Mario or Small Luigi, he or she can break the blocks with a Spin Jump. One of the Rotating Blocks contains a Beanstalk that leads up to the clouds. The cloud area has some coins to collect and makes this part of the level easier. If the player does not go up into the clouds, he or she has to ride more platforms. The player comes to an area where he or she sees ON/OFF Switches for the first time. While the player rides a line-guided platform, they have to hit ON/OFF Switches to change the path of the platform to avoid falling into the pit. The platform leads the player to the Midway Gate. At the same place, the player encounters some Fuzzies. Riding platforms may be harder due to the Fuzzies. After several more platforms, the player hops on one last platform with a Bonus Block nearby. The last platform guides the player to the Giant Gate. In the second half of the level, the player can use a moving platform to reach a yellow Warp Pipe. This pipe takes him or her to a bonus game where he or she can win up to five lives by hitting ? Blocks in the correct order. This page was last edited on April 9, 2019, at 02:49.